The Minnesota Public Utilities Commission (PUC) voted June 29, 2018, to approve construction of the Enbridge Line 3 tar sands crude oil pipeline through 340 miles of northern Minnesota. The vote was a bitter disappointment to water protects and those concerned about Minnesota’s pristine lands and indigenous rights. On Dec. 13, 2018, the PUC took its last procedural vote on the matter, denying a request to reconsider its approval of the new Line 3 route. There are still several opportunities to stop Line 3. Rejected the Minnesota Department of Commerce’s argument that Enbridge failed to meet state laws requiring the company to prove a new Line was needed based on crude oil demand. Rejected information in Line 3’s environmental impact statement saying the new Line 3 would create $287 billion in climate damage over three decades. Refused to acknowledge that treaty rights remained an open and legitimate issue. Rejected the clear conclusion from the Administrative Law Judge reviewing the case that it should not approve Enbridge’s preferred route because the costs outweighed the benefits. The Minnesota Department of Commerce filed an appeal, the Friends of the Headwaters filed an appeal, and the Youth Climate Intervenors filed an appeal. The Red Lake Band of Chippewa Indians, the White Earth Band of Ojibwe, Honor the Earth and the Sierra Club filed a joint appeal. Newly elected Gov. Tim Walz did not immediately commit to continuing with the lawsuit, wanting his staff to review it. On Feb. 12, 2019, the administration announced the Department of Commerce appeal would continue. “As I often say, projects like these don’t only need a building permit to go forward, they also need a social permit. Our Administration has met with groups on all sides of this issue, and Minnesotans deserve clarity, Walz said. Line 3 also still needs more than two dozen permits before it can start construction. One key permit is a Minnesota Pollution Control Agency (MPCA) Section 401 Permit allowing Line 3 to cross water bodies — and Line 3 crosses many. The new Line 3 would cross the Mississippi River — twice, including the headwaters — as well as affect many nearby lakes and streams. The U.S. Army Corps of Engineers also has to approve similar water crossing permits. We must put pressure on the state and the MPCA to apply the highest environmental protection standards. Who is Enbridge? Enbridge is a large energy transportation business with several tar sands crude oil pipelines running through Minnesota. Enbridge has a poor safety track record. Notably, it was responsible for a 2010 pipeline rupture that spilled more than one million gallons of heavy tar sands crude oil into a tributary of the Kalamazoo River, according to Wikipedia. Its impact was felt 25 miles down river. By 2014, the cleanup costs topped $1.2 billion. The largest inland oil spill in U.S. history happened on Enbridge Line 3 near Grand Rapids, Minn., and would have been much worse but it happened in winter when the ground and rivers were frozen. What’s the Problem? The current Enbridge Line 3 is failing. It wants to install a new and larger pipeline through northern Minnesota along a new route, cutting through the Mississippi headwaters region as well as prime wild rice areas. Canadian tar sands mining deforests land, pollutes air and water, and does great harm to indigenous communities. Minnesota’s environmental impact statement said the tar sands pumped through the proposed Line 3 would create $287 billion in “social costs to carbon” over the next 30 years. That reflects climate change costs to agriculture, human health, increased flooding, etc. That is a huge price to pay, especially considering the United States already is a net exporter of refined petroleum. We do not need this pipeline for our energy security. The Minnesota section of the pipeline violates treaty rights and creates unnecessary environmental risks from pipeline ruptures. Environmental Impact Statement: The PUC approved the final environmental impact statement Feb. 12, 2018. Administrative Law Judge Report on Line 3’s Certificate of Need and Route Permit: The report rejects Enbridge’s preferred route, based on a cost-benefit analysis. It leaves open the possibility of removing the existing Line 3 and rebuilding in the same trench. 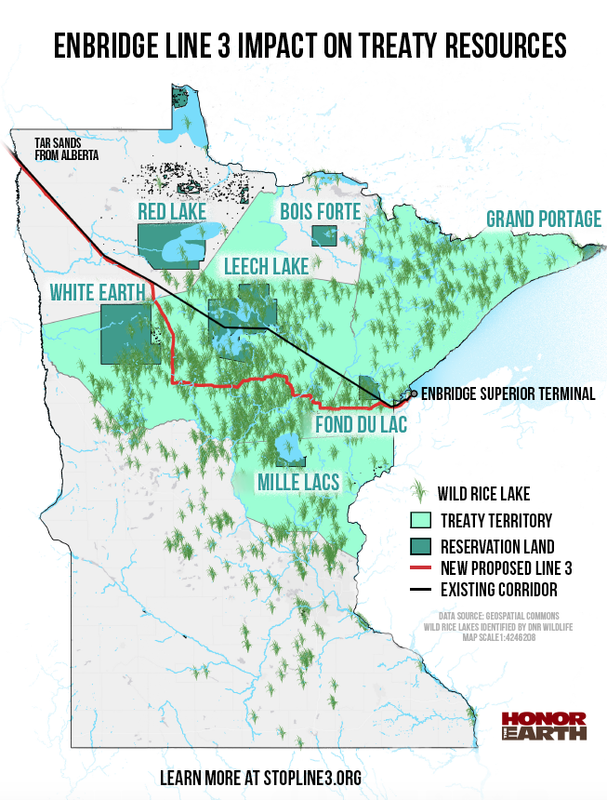 This would mean Line 3 continues to cross the Leech Lake and Fond du Lac reservations, a move opposed by tribes. It also would add more than $1 billion in costs to Enbridge. This option seems like a non starter. State Rules the PUC is supposed to use in evaluating the project. Below are resources to help you understand the proposal and why it is a bad idea for Minnesota. Jan. 30, 2019: Enbridge is Pulling a Bait-and-Switch — Will the PUC Finally Take a Stand? Sept. 7, 2018: Enbridge Uses “Trade Secret” Tag to Hide Inadequate Spill Insurance; Honor the Earth Tries to Bring it to Light. Sept. 2, 2018: Fond du Lac Band Chairman Explains Decision to Allow New Oil Pipeline to Cross Reservation Lands. Aug. 30, 2018: Water Protectors Ask You To Call Gov. Dayton to Stop Line 3! May 15, 2018: PUC Sets Line 3 Deliberation Dates; Come to Block (Line 3) Party This Weekend! Sept. 12, 2017: Dayton Remains Noncommital on Tar Sands Pipeline — Keep the Pressure On! Sept. 3, 2017: Line 3 Update: Paddle to Protect Youth Complete 250-Mile Journey; Petition Needs Your Signature; The Big Sandy Lake “Tragedy”; Pipeline Work in Minnesota? June 22, 2017: Line 3 Teach In: Learn about Proposed Tar Sands Pipeline through Northern Minnesota and What You Can Do to Stop it! May 23, 2017: Enbridge: Corporate Social Responsibility or Greenwashing?